The other day I went a book signing party for Michael Natkin’s Herbivoracious at Icenhauer’s. I got into a conversation, about food of course, with a student from the Natural Epicurean who asked me what my favorite genre of food is. I couldn’t think of anything, we had just sampled some colorful and spicy Vietnamese food and that was very much on my mind. Michael had talked (briefly!) about mudardara and I was thinking about how I hadn’t had Lebanese food in forever. I panicked. I’m a spaz sometimes IRL. I said “I like everything”. It is a total lie, I definitely have a favorite food and without a doubt to anyone that has met me, read my blog, followed me on twitter, come to my house, seen me in the morning, or gone on a trip with me then you know I certainly have a favorite genre of food and that culinary tradition is the mighty taco. 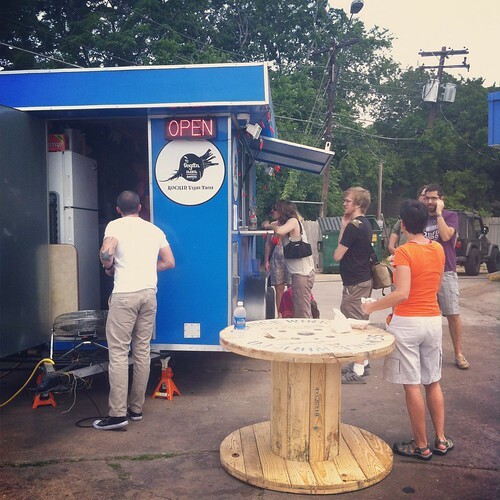 There is are quite a few places in town to get a fabulous breakfast taco (which I wrote about here) but now we have a new cart on North Loop, the Vegan Nom, dedicated solely to bringing us the wide range of vegan tacos! I finally got to try it last week, and I was pretty excited just to read the menu, they have 2 dollar breakfast tacos and 4 dollar signature tacos. Breakfast is served all day so that’s one star for me right there. The breakfast tacos are all the vegan combinations you would expect including, tofu scramble, tempeh bacon, vegan chorizo, refried black beans, caramelized onions, mushrooms, spinach, potatoes, and avocado. You can also add on from a long list of extra topping for an extra .50 cents. With the recent closure of Elsi’s I was saddened, but not surprised, to see the Vegan Nom doesn’t carry fried plantain. What can I say, it’s my favorite topping and it goes so well on a breakfast taco mixed with guacamole! Where am I going to get fried plantains on breakfast tacos now? The “signature” tacos include mostly these same toppings with the addition of vegan cheese and more toppings. I was pretty happy with my choices. The tofu scramble and tempeh bacon was the perfect protein packed breakfast and the flavors were right on. I asked the person at the counter for a tortilla recommendation, and she told me to go with the corn. It was pretty good but I don’t think they are homemade. Hopefully in the future when they get the kinks worked out they will start making their own because a fresh tortilla makes all the difference. 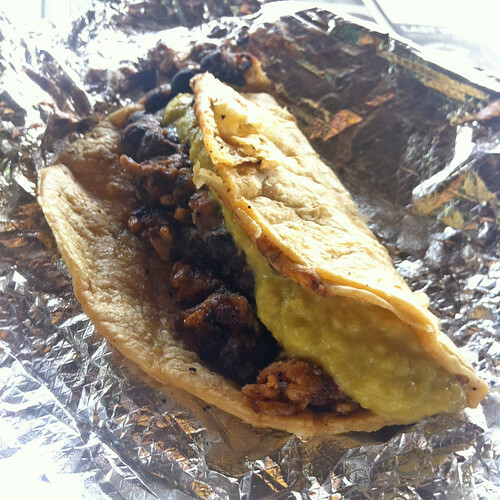 I also tried the refried black bean and vegan chorizo taco and was so surprised by the spicy-ness. I love a spicy taco so for me it worked out great but if you fear spicy things I recommend sticking with the red sauce. Also note, that there aren’t any tables yet and the parking lot isn’t the best spot to enjoy your food right now with all the folks that like to hang out outside the convenience store and ask for change. But you can order your taco ahead of time by calling and they will have it ready to go when you get there. And go there you should! I am sure it is just going to get better and better and for a trailer that just opened, they are clearly on the right track. Once the tables come they are going to be staying open for dinner too. I can’t wait to go back and try the rest of the menu. I wanted to note that they have totally fixed the outdoor seating situation, now they have some umbrella tables right next to the trailer and they have completely fixed up the back tables and it’s very inviting and super cute. 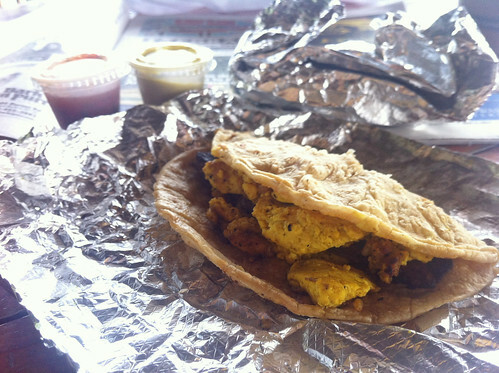 This entry was posted in Austin, Austin Restaurant Reviews and tagged Austin, breakfast taco, Taco, vegan on May 7, 2012 by lazysmurf. It was worth waiting for your final answer! 🙂 Thanks for sharing the review and for the link. See you at the next event! I still need to try this place! Maybe we can ask them to start carrying fried plantains? I always blank when people ask me what my favorite kind of food or band or book is–like, really, I have to pick one? !